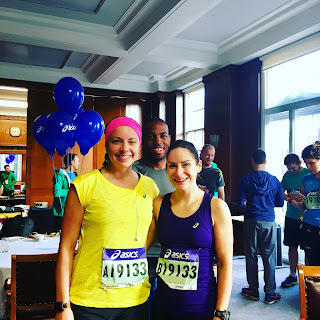 So … did I tell you I ran the relay for Manchester Marathon? I was running the relay with Corey which meant I'd be running the second half of the marathon and waiting at the crossover point. We had been put on the spot at registration when we had been asked for a team name. There didn't appear to be anything around to give us inspiration so after staring at the ground, the registration lady (who incidentally was my friend from run club Tracey from COVENTRY!) and the sky we decided on a combination of our names and went with Team Scary. I had lots of fun waiting and watching the marathon runners come past. I'd like to say I did AWESOME cheering … but I only did that for about 30 minutes then lost my voice from all the enthusiasm. The people standing near me looked pretty pleased about it though. However as I was chatting all things food, I heard my name being called … and there was my amazing fell-running, crazy-ultra-lady friend Claire running past! Gave Pilla one last hug and sprinted after Claire like a lunatic – well a BIT like a lunatic – and caught her up for chatter. Claire is AMAZING. She has done more marathons than she has run parkruns and every time I see her Facebook feed it's full of insane photos of her running up mountains or doing something equally insane. We always have an absolute blast when we see each other and this run was no exception. Marathons are AWFUL aren't they? Awww ... check out how teeny and not-bitey he is! And then Claire decided she wanted to smash her marathon PB. So she did. So we had a pint. Same again next year, Claire? You arrange the ponies and I'll bring the camera.